A Massachusetts physics graduate student and former alt-rock drummer was arrested for planning a terrorist attack on the Pentagon and on the Capitol. But unlike most wannabe terrorists, Rezwan Ferdaus appears to have actually understood how to make bombs. An American graduate student working on a physics MA was arrested yesterday after authorities discovered he was planning to attack the Capitol and Pentagon with explosives-laden drone aircraft. But unlike other failed plots, there was something different about the former aspiring alt-rock drummer Rezwan Ferdaus’s plans: With some tweaks, they could’ve actually worked. According to a federal affidavit, Ferdaus told undercover FBI agents and a cooperating witness with a criminal record of his plans to attack both the Capitol and Pentagon using large model aircraft. The model aircraft would be filled with C-4 plastic explosives connected to a mobile phone detonator. 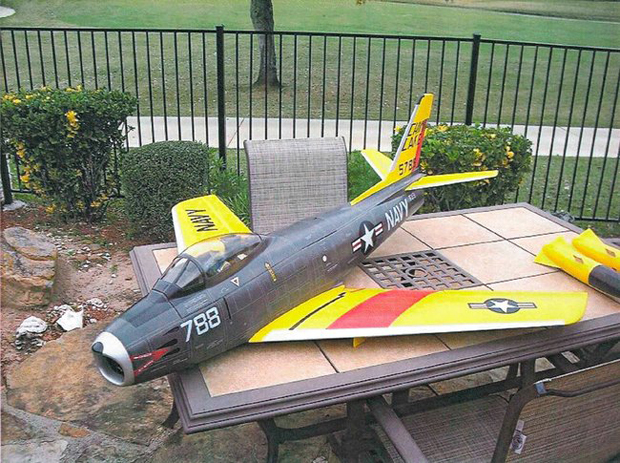 Ferdaus’s preferred variety of drone aircraft were scale models of the F-4 Phantom and F-86 Sabre that range from 60 to 80 inches in length and have wingspans that vary between 44 inches and 63 inches. The drones would then be guided by GPS equipment, presumably through one of the numerous open-source GPS-based navigation programs out there. Undercover FBI agents seeking to arrest Ferdaus supplied him with a staggering array of goodies: Six assault rifles, three grenades, 25 pounds of C-4 plastic explosive and an F-86 drone. Ferdaus also built homegrown detonators that apparently worked. Apparently a baseball fan, Ferdaus used the name “Dave Winfield” as an alias for his terrorist activities. Users on the diydrones website, which is dedicated to the growing amateur drone/unmanned aerial vehicle (UAV) community, are pissed. Forum posts calling Ferdaus a “noob” are among the milder responses; other users note the poor choice of what are essentially high-priced model aircraft for war nerds to pull off a terrorist attack. One user, astutely, notes that a successful takeoff for the planes would require a substantial dedicated runway and plenty of practice to avoid the explosives detonating on the ground. Basically, Ferdaus was “a Darwin Award nominee” waiting to happen. Model aircraft and drones are exceedingly poorly suited to lone wolf terrorist attacks. Despite the use of drones by the U.S. military for targeted strikes and assassinations, operation of these types of unmanned aircraft require access to resources and training generally available only to domestic and foreign military forces. In other words, if you don’t have North Korea or Pakistan training you and supplying AGM-114 Hellfire missiles, fuggedaboutit. The many drones easily available to the civilian market are good only for surveillance and aerial monitoring. However, Ferdaus’s plot could have conceivably worked had he not been fixated on disaster-from-the-sky dreams. Ferdaus’ homegrown mobile phone detonators appear to have been effective and his FBI-supplied explosives cache could have helped build a considerable car or truck bomb. According to the federal affidavit, Ferdaus appears to have been obsessed with the idea of using remote-controlled aircraft for the attack. A close look at the same document, however, reveals that Ferdaus obtained most of the non-explosive equipment to build a bomb from a number of trips to Toys R Us and, presumably, a large megastore such as Walmart or Target. That’s the ultimate, disturbing takeaway from this: Explosives are relatively easy to obtain for any civilian with a reasonable cover story, oodles of cash, and a brain not addled by kooky conspiracy theory-and-religion mashups. Bombs with detonators and timers are relatively easy for anyone with a scientific or engineering background–such as Ferdaus–to construct. The barrier to a successful American terror attack isn’t bomb construction: it’s the fact that most wannabe terrorist attacks fall for federal sting operations hook, line, and sinker.